KERRY CASSIDY (KC): Here we are with Valery Uvarov, we are Project Camelot and we're very pleased to be here, in Saint-Petersbourg, Russia, and how do you say that in Russian; Sankt-..? Valery Uvarov (VU): Sankt-Peterbourg [smiles]. KC: Sankt-Peterbourg, OK! it's a beautiful city, lovely, and you are very interesting man, we're very very pleased to be here and welcomed into your home. You've been a very gracious host, and thank you very much for that. VU: you're more than welcome, my friend! KC: [smiles] thank you! So, we wanna begin with whatever you're comfortable with, whatever you would like to tell us about yourself. To begin with, we would be curious as to your history, how you came to be where you are today. We know that you are working with the government, is this true, at this time? [slide]: Valery Uvarov, Head of the Department of UFO research, Paleosciences and Paleotechnology of National Security Academy of Russia. VU: well, yeah. More or less. Everything was changed in my life in 1989. Before, I was a professional musician, I was studying mathematician and also, I was studying artist, I'm a painter. In that era, when I suddenly noticed that the music I play, the whole life I’m living... is a little bit different to something that is going on in reality around me. I have just understood that our civilization, our Planet has a certain, or kind of problems, and it was a choice for me, whether I play music as I did before, or I will try to take my part in the solution of the problems that I saw around me, in this life. And I made a decision. KC: was it... were you prompted to go to this UFO conference because you might have had an encounter with the visitors, if you would call them that, prior to that? Consciously? Or was it unconscious that you were prompted to go to the conference, but you weren't sure, why ? VU: in my childhood, I have encountered someone... but at that time I didn’t realize what took place. For me it was something, well, maybe, usual, strange, but usual. Then, I started to see strange visions, Universe, flying space crafts, the other things, I was crazy about any films, any books about, you know, extraterrestrials and fantasies. Probably, it was always inside of me. But in that year, 1989, it was like a deformation and a transformation, I suddenly understood, clearly understood, that this new way is the real way for me. KC: How old were you then, do you know? Approximately? VU:: Well, approximately? [Smiles] it was 36 years, and everything was changed, and I'm happy about it, I tell you. Really, now, I'm very lucky man, I do what I love to do, and I have made some very important discoveries, and I hope, and I'm always sure - we will talk about it today, - and I'll share some very interesting ideas. KC: And you have written some books, as well? VU:: Sure, I have written some books, some articles. Also, I do publish Nexus magazine here, in Russian language, I'm a main editor. KC: Wonderful. And, originally, we saw you as associated, being interviewed, as a part of Secret Space, this was Chris Everard's video on the space program, you also have knowledge about this, is this true? VU:: Yes, this is true. KC: And you also have background in mathematics, can you tell us, what that is? VU:: Yeah, it's a Sankt-Petersburg Public Technical Institute, where I have studied it. KC: I see, is this a formal degree that you have, or is this some years of study? VU:: No, it's just happened that it was some years of study, some of it, and then when this year came and I have denied everything and I just was concentrated, completely focused on investigation, so I have left everything and started to do what I've started to do. But at the same time, being a professional musician, painter, and on one hand, mathematician, it's much easier for me to understand what's going on, I can see one event, or, let's say, object, - watch it from different points of view: as a musician, mathematician... it's much easier. KC: This is very interesting, and then you have - what would you say - I mean, music and mathematics - this is a lot of similarities, right? VU: On one hand, yes, on one hand. I can look at things very freely. I'm not hidden in a small box of a science, you know. A mathematician can look at the world just like the mathematician, OK? Me - not. I'm trying to see the event from different points of view, and it's understandable for me. Especially now, when I need to see something hidden behind, for example some events in the history of our civilization, I need to open mind and try to understand what stood behind this event, so I need to have a very broad view, and to be a musician, mathematician and an artist, it's very very useful. KC: Now, your current job or title within the UFO, the government, do you have a title? VU: Well, actually, it happened like this: those people in military and government, who engaged for many years in investigation of UFOs, they knew about me and they have invited me to be a part of their interests. VU: Actually, it was like this. They have invited me and, for example, there are a couple of organizations whose help I use in investigation, I'm talking openly: I use their help when I need to get access to hidden data bank, or some information which you cannot find in a library, so for this reason I'm part of military organization and I'm able to get access to anything I need. KC: You've done investigations on the pyramid and pyramid energy as well, and perhaps they give you access to the pyramids or the Sphinx? VU: Yeah, sure, but on the other hand, I'm interested in the science standing behind the pyramid, this is the key moment: science. I'm absolutely sure that those people whom we know, or whom we call Herophiles, ancient Egyptians, actually not Egyptians - Atlantian priests - it was post-Atlantian priests. They were scientists of a very, very high level, I'm completely sure about that, and I actually am deeply interested in knowledge which they embodied in pyramids, in temples and in anything they have used. First of all, to develop the abilities, angelical abilities, which later on help to open up supersensitivity, on one hand, and then, clairvoyance, most of those abilities which they had, and you know they were very unusual abilities, they were very, very powerful people. We now developed in a quite different way, so that's why it was my deepest interest to see, what actually they have reached, they have filtered and they have received. Well, pretty soon investigating ancient texts, I also came to the conclusion: all the knowledge that they had, they have received as a gift from a very, very high extraterrestrial civilization. And when I understood that, I said: "Now what I need to do is to try to find any, even small, piece of that knowledge, left anywhere: on a wall of a temple, in the pyramids, in ancient texts, I need to field it out, to gather it here on my table, analyze and bring out the whole knowledge". KC: So, you started this quest, I assume, after this experience in this realization you had in 1989, so now we are in 2007, right? So for this number of years you've been working quite a long time, and you've written books about the pyramids and you're building a pyramid, I understand. Is this correct? VU: Yeah. Now we're building a big stone pyramid according to that knowledge that I received investigating the ancient pyramids of different civilizations. KC: And what is this knowledge? can you tell me of a couple of key things that... You were building, actually, more than one pyramid here in Russia, not so far from here, you said? VU: Yeah. It's just 100 km from Saint-Petersburg. We have found a very ancient place where people were making like "rituals" for a few hundred years. There's an earthquake, like a breaking, with a beam of energy getting out of the ground... So actually, I have done everything according to the ancient knowledge of how it should be done. So, we found the right place, actually, these are three very good places. Now, we're setting a pyramid on one of these places. VU: Yes, it's a pretty strong energy vortex, - it's a key moment, - we should do it. But at the same time, I came to the strict conclusion that what we actually know, I mean our civilization, knows about the pyramids and their effects, it's almost nothing to reality, in comparison to reality. This is the reason we have decided to set up a pyramid made according to the knowledge, not like a pyramid shapes, or some proportions, which actually we met investigating different pyramids. No, it's too small a part of information. No, it's not enough, there should be much more. First of all, when the ancient priests were constructing the pyramids, they were doing it, trying to tune to a certain person, for example, for a Pharaoh, or a priest. The Cheops pyramid is quite different instrument, and I was always interested what knowledge, what made this pyramid a powerful instrument which could not only influence your energetic system, develop your abilities. First of all, how to get access - now listen very carefully - to the parallel dimensions of the Earth and Time, it's a key moment, because there you can find information about the history of the Planet Earth, and not only about previous time, also about our future. So, you can get something that you cannot even imagine. This is the reason why I have devoted the whole book which I just wrote and published here, in Russia. KC: I see. But are you talking about also using the crystals, the power of the crystals. VU: We are going to set up up there energy sources, not just crystals, its energy sources, because if you just set up a pyramid without an energy source, you will never get what you at least imagined to get. KC: The vortex, is this is not the energy source, the major...? No? VU: No, no, it's like a gas, OK? It's like a gas. But to get power out of it, you need a motor. So, what I call "energy source", it's a device, it's a certain device which you put inside of the pyramid, in a certain place, and the pyramid will affect the space and time, making kind of a combustion of space, and here starts something very, very interesting and unusual. So, we came to this understanding and we immediately decided to start construction of the pyramid and we have started to do this, at the end of the last year, and I think at the end of this October, 2007, we will complete construction. KC: Now, have you shared your knowledge with other countries at all, or is this purely inside Russia? VU: Actually, it is purely inside Russia. KC: Because this would be very interesting, I'm sure, to most - well, certainly, to American researchers, - but other countries as well. VU: I love some American researchers, like for example, Graham Hancock, [two more names: Nevil Burrell? Jill Burton? inaudible] and others, many others. I love them very much, they affected me deeply, you know. I want to say Thanks to them for all they have done, and, you know. At the same time, they brought to light, to people some very unusual ideas, saying: "Listen, just look attentively at the pyramids", or "Look attentively at..." some other things. They just point out that there's something unusual but mostly, they were not giving answers. VU: What I'm doing, I'm trying to give answers... More or less. I'm lucky to find answers and the book "The Pyramids", it's the book having answers. KC: Now, you mentioned over our short lovely meal that we had, that you had some sort of interactions with these visitors. They kind of guided you on the journey that you're on now, is this right? KC: They gave you some insight into where you should go with this. VU: Yes. On the one hand, yes. KC: And you call them… What did you call them? VU: I would call them "visitors". To say "extraterrestrials", on the one hand, you can call them extraterrestrials, but on the other hand, when you start to understand how actually this Space is constructed, you come to the understanding that the most distant place in our Galaxy is less than 1 minute to go to, to the Earth. It means, well, according to what we know about our Planet, and in comparison with the period which our civilization is now here on this Planet, these the people, human people are visitors here. They are so long, so many times, so many thousands of years here, controlling the situation. I would say, them as those people who are trying to keep the whole situation on the Planet on a certain path. So, when I met these visitors in my life, for the first time, it was pretty long ago, I was on an expedition, my first simple question was: "Well, what are you doing here?" At that moment, as any normal citizen, normal people, even an American, just having ideas about their abilities, they're flying, they're having so unusual possibilities... well, what they're doing here? what is their interest? Their answer was pretty simple, and at the same time, this answer just turned ups my life. One of those whom I saw, said: "If you want to understand our interests, you should learn the history of your civilization, your pre-history. Then you will understand our interests." From that moment, I started to do my best investigating of the history of our civilization, and now I can tell you, I came to understanding what took place and what their main interest is in. KC: OK, what is their main interest, do you think, is it the future and the future events that they feel are coming down, or is this a genetic interest in our species…? VU: No, no. First of all, I would like to explain to you that if you want to get just one answer, you will never get the right answer. It's on the one hand, pretty complicated. Then, if you at least would prefer to make a short step forward to understanding, what I would recommend to you is just take, if you can, and understand, that there are no past and future, there is only present. Now, what is going on now. For me, at the beginning, it was like nothing, I thought: "What does it mean? No past? There is no future? Everything is going on now?" I had to investigate and to be inside of this proposition for a pretty long time. Then, when I understood how it works, and it's really so, then you start to deeply understand, that if you plan, if you want to change the Planet, the Humanity, you know, actually, something for better, develop it in the right way, you need to know what took place over there, and at the same time, you need to know what will happen for us in our future. But as soon as this future, for us, is actually already taking place now. So, from your future you can go and get into contact with you in the past just to help yourself to change something in your life in the past for better. Then, if something will happen different, your present will be changed, and your future will be changed for better. It's only one way. So, what they are doing here, they are trying to keep and to, somehow, control these multiple dimension events of our life, so that we would understand how this is all constructed. They never interfere, they only can give just a small, tiny idea. So just a hint. And then, if you are the right person, you should understand. Wat you will do then will be your personal responsibility for the future. It's not like some teachers or people say: "Well, extraterrestrials and gods, they are so perfect, they will control me. Even if I will make a mistake, they will help me correct my mistake, then..."
No, in reality, it's not like this. What they can do is just give you some hints, but then you take your own personal responsibility. KC: So, have you studied Eastern philosophy, and, you know, Enlightenment and knowledge about the chakras and so on. VU: Sure, I did it completely. But some couple of years later, I came to a strict understanding that if you start, or you will try to see what stands behind this knowledge, using the knowledge, for example, of Buddhism, or Hinduism, you will never ever get reality, it's impossible. Because in the way, in the form which you can use and understand, this knowledge stayed (I usually say, alive) only in Egypt, only in Egypt. In my book, I'm showing these texts. If you take Hinduism or eastern tradition, it's so deformed; it's so already turned into different parts and pieces, that you will never ever get the understanding of Reality. This is the reason why I deeply dived, I will say, in Egyptology, working with texts, because there you can see the beginning of the whole story. And in this book, for example, I gave already this very, very old knowledge that was named, or called, in ancient times, Cabbala-Ohn. This is the knowledge of a Unity of construction of Human and Universe, how it was constructed, it's actually one and the same thing. So if you want to understand it, you should start from the beginning, and this beginning, not deformed beginning, you can find only in Egypt, nowhere else. KC: Now, when you said you were contacted on expedition, where you in Egypt at the time of your contact? VU: Yes, it was an expedition connected to my investigation of the Tunguska case. KC: AH! Now, we want to hear about this. Tunguska. 'cause you have just written a new book about this, is this right? VU: Actually, I'm going to finish it; the whole book will be devoted to the one hundred years anniversary, next coming year, (of Tunguska case). And this book will give the idea of what took place over there; actually, you will get answers... You know, within the last 70 years of investigation, scientists at least have got and brought to people around 300 different hypotheses, and most of them are so different, people cannot put it together. In this book, I'm putting it all together and giving you, I'm describing the whole event, so that all these different hypotheses are coming together into the one. Bill Ryan (BR): Yeah, we met Chernobrov and we asked him about Tunguska, and he said that there was a similar event that happened near Lake Baikal, much more recently. VU: Yeah, I know this. KC: So, does he agree, or do you agree with him, or is your understanding different? VU: To say: "agree" or "not agree", it would not give you the right approach, my own approach. Actually, working... I'm trying to find an answer, what took place in Tunguska. I've learned a lot of materials, lot of results of investigation of different scientists, and I'm very grateful to them for this, they gave me a lot of information. I would never do it myself. At the same time, when I came to understanding of what took place there and what is of critical importance, is that people have described and explained what took place in Tunguska, I mean this event, they have this answer in a few years of this event, actually, they gave it almost immediately. The problem was that when scientists, representing different fields of science, came to Tunguska and started to ask witnesses what they saw, they naturally just took the whole story but in small pieces. Because those people who had botanical education, they tried to explain the event from their point of view; astronomers, they tried to explain the event like a comet or meteorite; geologists, they give their own understanding. So, they tear up the whole story into more than 300 small pieces. But at the same time, you should understand, because that event was the one event. And there's only one truth that stands behind it, and actually, if you just ask yourself, you would agree that something - well, on the one hand - pretty simple took place, which we cannot see - because all traces are out there, in the Tunguska area, everything is there - and if we do not see these traces, it does not mean that something else took place there. The whole story, the whole explanation, on the one hand, is out of even possibility for human people to accept... The reality. What I would say at the beginning now, shortly, that is was meteorite, yes, it was meteorite. But this meteorite was carrying a dangerous bacteria. And somebody shut it down, destroyed it, and they did it many, many times. And they do it each century, for a few times. When I was investigating the documents, I found very interesting stories. Listen, shortly: when Stalin had learned about the Tunguska case, and especially Lavrentiy Beria - he's a very, very special man who was subjected to investigate and to influence development of nuclear weapons in Russia at that time. He has got information about an unusual event, looking like a nuclear explosion that took place, in 1908. So when they have investigated pictures, they sent an expedition, military expedition to that area. And that military expedition was in civilian dress, they had only one task: to get information; and now look. When they asked some people in the area of the explosion, people said: very shortly after the explosion, local indigenous people saw a group of strange visitors, having very highly developed equipment on them, in 1908, investigating soils. So, they saw them. Tell me who they were? Very highly equipped people in 1908? Who were they? It's just a short beginning, but at the same time, I can tell you, the reality is amazing, amazing! There is somebody who is preserving the planet Earth, because of this meteorite having a dangerous bacteria. Somebody has created, constructed what I personally call "an installation". Part of this installation is in Siberia, and it's active. On the other hand, and I'm very sorry about it... One of the... devices, having close connection to this installation, is situated in China and China already found it, and they are investigating it. KC: Are you saying, that they have something, that contains this bacteria? VU: No. They are investigating a part of equipment that was shooting down the meteorite. This is serious. KC: This is the visitor's equipment, is it not? VU: Yes. I know exactly, they found it and they did investigated it already. In the near future, you'll be witnessing a jump in development of some technologies in China, much, much more advanced, than you can even imagine. VU: Unfortunately, do they do investigation of this in Russia? No, they still not. KC: How did you find this out, though, can you tell us? VU: No, if you allow me, I will keep it, OK? VU: [smiling] but believe me, they already do it. We have a lot of this material, over Siberia, a lot. I would say thousands of tons of these materials. But, you know, our science and...representatives of our science today, they are not interested at all. KC: Well, when your book is released, it's not yet released here, is that correct? VU: You mean, about the Tunguska case? VU: It will be released next year. KC: OK. So, once your book comes out, perhaps, this would change? VU: I'm not sure about this. VU: No. This is the reason why what I do plan personally, I want to organize some expedition, one or two expeditions, international expeditions. VU: Some people from America, Russia, Germany, Australia move there, so that when it will happen, it should be under a reasonable control of Humanity. VU: Because there, just at this particular moment, just believe me, you have nothing to do, just to believe me! The technology there, at the particular moment, is so developed, you even cannot imagine. KC: OK. Now, I have a jump for you, because you said also, during our dinner conversation, that there were 3 events that were, I guess meteors, that hit the Planet, at different periods of time in history, and changed our Planet. Can you tell us a little bit of that? Then you said, Tunguska was a tiny event in relation to these bigger events. VU: Sure, sure, sure. You know, if you just read materials brought forward to people by astronomers about asteroids, defense system, which actually, Americans are working on, you will find the idea that, for example, big asteroids, maybe 1 km in diameter, are hitting Planet Earth maybe one time in 300 thousand years, or maybe, even in one million years. When I was investigating the ancient texts, I came to - not only understanding - in my book "The Pyramids", I'm giving the ancient texts, everything, in translation, everything there, - the asteroids with a diameter more than 1 km, hit the Planet at least 2 times within the last 16, 000 years, at least. Actually, 3 times, but first two, especially those that I name Azores, which hit Planet in the area of Azores Islands. It took place exactly 13,660 years ago from the autumn of this year, exactly. And in the book, I'm giving the exact calculations and ancient calendars, showing you the exact date when it took place. KC: Now, are you saying that this might be a cyclical event? VU: Yeah. This is...you did it, my friend! Great! VU: This is the most important idea, that those ancient calendars: Mayan calendars and some of ancient Egyptian calendars, which I call "Catastrophic Calendars", they are giving information about the periods when HUGE asteroids are hitting the Planet Earth. And those ancient Herophiles, they were trying to bring, or to give or to leave, for following, future, people, information that in a certain moment a falling asteroid will hit the Planet, you should be ready for this! Otherwise, people can be, you know...killed. KC: So, to jump from here, we can say that there's another event scheduled sometime in our future, in which this may occur again. VU: I would say, that the most interesting and unusual event which is ahead of us and very close, very,very close to us. KC: Are you saying, the Mayan Calendar 2012... Around this time? KC: Is this your understanding, I don't know if you studied the work of Zecharia Sitchin? VU: Yeah, I know his work very, very good. KC: And are you're talking about the returning of Planet X, or you talking about The Brown Dwarf, which is talked about by scientists, because we have some contacts who are talking about what they call a Brown Dwarf, with a Planet that is accompanying it in a circular orbit, this orbit being very elongated, 26,000... This is not what you are saying? VU: I know this theory, very very good (well), but the reality is quite different. VU: Again and again, even...Now, at this moment, I would like to repeat again: what I'm working with, are the ancient texts, which you can use and read and interpret. These ancient texts say that 13,660 years ago, when Azores asteroid hit the Planet Earth, Planet Earth lost its orbit and started to fly away from the Sun. Somebody, whom we call - now... as the Curators, somebody - took a huge part of destroyed Planet Maldek, which - this huge part of this planet which now we name the Moon. And these ancient texts, Egyptian texts, give you the exact description that somebody took this huge part, this piece, into the magnetic field of the Planet Earth, increased the mass of the Planet Earth and fixed the Planet where it is now. Before, Planet Earth was moving around the Sun with a period of 360 days. When it moved away from the Sun and was fixed there with the help of the Moon, now we have 365 days. So, right after that, they have created Venus, and put Venus where it is now. Ancient texts, even Mayan Calendar says that Venus was created 3,113 years before Christ. OK? But what took place also, those who were living on Mars, an ancient text says exactly, those who gave the knowledge to the previous civilization, they were from Mars and Maldek. But now you see, these planets are... Maldek is destroyed, we have an asteroid belt around, no planet. Mars was attacked by asteroids, lost its atmosphere, moved away from its original place, but that somebody had fixated him, also, there. But those who lived on those planets, they have moved to one other Planet of the Solar system. I don't know how, but the idea that this Planet now, is on the same orbit as the Earth, but right behind the Sun. Quite opposite, we are moving with the same speed, and this is the reason why we mostly cannot see it, but at the same time, there are periods when we can see this Planet. Astronomers have seen this Planet and they registered this Planet. And in my book, I'm giving you, you know, the full description of these events. KC: Are you saying, these people, do you call them the Annunaki, or not? VU: Yeah! Doesn't matter how you call them, doesn't matter. VU: I wouldn't say genetically... No, it was a little bit different. Genetic effects took place on Planet Earth a very, very long time ago. Much far... I mean, this event is quite different. So, the main idea is that on 2012 we are about to witness, I would say, de-stability of the Solar system. VU: No, no. It will be in connection with unusual activity of the Sun. VU: Yes. Unusual activity of the Sun on the one hand will affect instability of the Planet behind Earth... behind the Sun, sorry. Behind the sun, that's the first thing. But on the other hand, there's another very, very important, KEY moment. If you remember ancient Mayan texts, you will find some interesting idea. This text says: previous Star teachers will go away, and new ones will come here. And we, I mean, people I'm working with, we have found and understood a mechanism, what stands behind this. To understand this, I need to give an idea of a certain energetic mechanism of the Planet Earth that is closely connected with time and space. [on the computer graph]: This, what you can see now here, this is the geographical axis, OK? This is the magnetic axis. So, when it starts to rotate, it forms like this. So, the central focal point is here, you see? This is the 30 and 35 degree latitude. This is exactly where all civilizations of the former world have developed. China, Egypt, Mayan - everything is here. So, now look: investigating scientific materials, we came to understanding that this part, when it goes wider, or different way, this pulsation here and here has a period of four years, a four year period... But now, something unusual started to take place. This part started to go wider and wider, and this focal point started to move to the North. On 2012 this focal point will move on the Northern Pole, and a field of space and time will be opened. And this is... Here, we will be witnesses of the appearance of a Stargate. Through the Stargate, former teachers will go away and new ones will come. And everything, all these events will be closely connected with activity of the Sun and appearance of instability of the Planet behind the Sun. So, we are not only about to see this Planet, and it means we will be very close to start a reasonable, understandable contact with our predecessors. KC: So, are you saying that also the movement of, if I understand it correctly, our Galaxy close into the center of the Galactic plane, do you see anything of this influence? VU: What you mean, when the Solar system flies through the Galactic plane, this is the moment when we go through meteorite flow and asteroid flow. That's why we periodically move through it and we have these asteroid impacts. But what I'm talking now, is a quite different period, and very unusual period. VU: Not we. We will be here. We are here and we will stay here, where we are now. But those who were controlling the Solar system, I mean the Curators, we will be witnesses of how they will go. Someone will go away, and new ones will come here. VU: All of them, but mostly scientists. KC: So, there are scientific bases for this understanding? VU: Yeah. What I'm giving you now, in a simple way, it's pure science. KC: OK, I understand. So, the Stargate that's opening up, is this at the North Pole, you were saying? VU: Yes, the North Pole. VU: On the one hand, yes. Yes. What I would say, first of all, what will take place on Planet Earth will critically affect human health. Those ones who now have not good health, they will be dying of heart attacks, you know, blood vessel problems... We came to understanding, it's a key moment, those people who are developing inner abilities, energetic abilities, clairvoyance, something like this, in any case if they are doing it without knowledge, which was left behind by ancient priests, 70% of them, even 80% of them are dying from cancer. What it means, and how it happens... An answer is in the field which we can now try to explain. Look, when somebody starts to meditate, trying to get a cosmic energy, OK? Imagine, energy is coming into you, and it happens, that's all right. When you are a bearer of this energy, your own inner biological time is slowing down. On one hand, that's OK. Because you will feel much more energy inside, your clairvoyance will be opened... This is what we need, but when the phone has started to ring, or you need to go back home, to do what you should do for your family, you just switched off from this energy vortex. Immune system made... this… Uh, the new system tries to return back to the normal position, OK? Speeding up... inner time. Because you have slowed it down. Immune system immediately starts speeding it up. Speeding up of inner time causes the beginning of the cancer, immediately. This is the reason why the world well known teachers like Jidda Krishnamurthy, Ramana Maharishi, Vivi Kananda, Shiva Rabinda, Mira Alfas, the mother, actually, Madame Blavatskaya, Rerich, Castaneda, Osho... all of them died of cancer. We have found this warning left by ancient priests. This warning says that if you will be developing your abilities without knowledge of how it should be done, you will never cross the border of death, you will die. So, we have found these texts, we understood the meaning. First of all, we started to investigate and develop the system of defense, for myself, for the specialists and scientists I'm working with. This is the key moment. And actually, this is the reason why, I would say, people in the nearest future, when 2012 will be very close to you, you should take into account that you should perfect, you should develop your health. Otherwise, thousands of people, maybe hundreds of thousands, maybe millions, will not survive these changes. 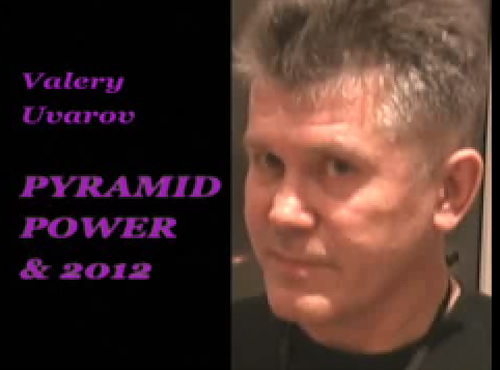 KC: Well, is this not also, first of all, the pyramid is considered an ascension, a machine for ascension, and in a sense what you are talking about, is this ability of the body to ascend spiritually through the use of this medium? VU: No, I wouldn't say it like this. Everything is much simpler. When you take... when you're talking about ascension, in reality it is different. No, much more simple. What you need to do, is to correct two flows of time, which actually, we call like EEN - YAN, BAH - KAH, we think that.. everybody think that according to the Eastern tradition, it's like a human beginning, I mean, male beginning, female beginning, or something like this, and we should balance these powers and then, well, everything will be OK, no illnesses. On one hand, that's more or less true. But the reality is quite different. This EEN - YAN are two flows of time, moving to each other. So if these flows of time are balanced inside you, you get a very interesting effect, you cancelate your biological time. And then you can live 100 years, 200 years, 500 years, 1,000 years, - no problem. But it should be balanced. Time. Pyramid is correcting time, biological time on the human being. KC: But this is triangle, the top point of the triangle symbolises this unity. VU: It means, that you are talking just about symbolisms. I'm talking about mechanisms, it's a different thing. Sure, human being one thing, power - another thing, and third one - it's a BAH-KAH human being. Trinity. It's like a plus-minus in electricity. If you take plus and minus, immediately interaction between them starts. Three. OK? It's a principle. So, this triangle is nothing else than, well, the symbol of principle. But, we are talking about mechanism. How to use - not a symbol, symbol you can put here [pointing at his t-shirt] you can walk around. At the same time, if you have a symbol here, it doesn’t mean that your inner time is balanced, no, completely no. We need to balance it. KC: What is your plan, for going into the pyramid? Using the pyramid to help balance this? VU: It's not only just to go there and to balance it. On one hand, yes. On the other hand, it's a practise. We are developing the practise. As long, or as soon as we read some ancient texts, we came to understanding how it works. Immediately we started, or we tried to set up a pyramid and to use it. We made it, and we saw the results, very interesting results, and now we want to develop it. To develop it, we need a real instrument, real pyramid. KC: So, if you build these pyramids in this one place, is it your suggestion that eventually more pyramids are built on the Planet? VU: That would be great. At least, we are going here, in Russia, to set up more pyramids. Now, we'll be setting up in the certain area where we work now, at least 2 pyramids, or 3. And at the same time, we are now planning to set up a complex of pyramids, which will have 9 pyramids. A complex of 9 pyramids. Sure, if we set up some complexes around the world, as an ancient text says, energetic capacities of the Planet, positively affecting growing of a human consciousness, it will affect, it will happen. It's a key moment; you cannot do it the other way. So, if you want to develop it, and to stimulate it, the pyramids is a key moment. But the pyramids should be set up all over the Planet. KC: Now, what about the Indigo children? We interviewed Boriska few days ago, he has recall, as you know, having been in the Nexus magazine, and you know about article that was written about him, and he has recall of his past life on Mars, and he talked about the wars that went on, and then he talks about.. He's basically, coming here as a young child with total recall. Is there something that you know about these little children that are being born now? You see, in a sense, are balancing already these key elements of the positive and negative, so they almost do not necessarily need the pyramid to be there already. Do you understand what I'm saying? And have you thought about this? VU: Yah, I understand clearly. This is the reason why I say: pyramids have been and will be the key moments. What about the people? Having these possibilities? Actually, there are much more people having these possibilities than you can imagine. But unfortunately, most of them are not able to develop further, on a high level. The pyramid is an instrument which is giving you the possibility to step over the border of death. I'm sure that the development of inner abilities, whether you are Indigo child or not, this development will affect your system and will cause problems with health, especially cancer, for sure. To step over, we need to use knowledge and instruments, tools, and a pyramids are critically necessary tools.